I remember as a kid when I was supposed to do chore but I wanted to go play, I would tell my parents that I would do it tomorrow. My Dad told me that tomorrow never comes. As a kid I would think that yea, I go to bed tonight and when I wake up it would be…… today. 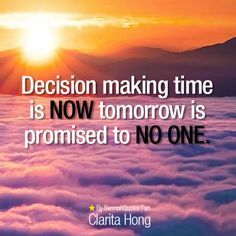 I also figured out that if you put off something til tomorrow, something else always seems to get in the way or we give it a higher priority. I wanna talk today about putting off our salvation or our time with JESUS or our witnessing til tomorrow. If you need to repent, right now. If you need to get Baptized, right now. If you need the Holy Ghost, Receive it right now in the Name of JESUS. No more excuses. Today is the day of salvation not tomorrow. Tomorrow might not come. There has to be no more excuses. We chose each day whom we will serve. I chose JESUS. Who do you serve? Go with the Champion. Go with the one who Loves you and cares for you and has prepared a place for us in heaven. It’s so exciting to live for JESUS because of who HE is. HE is our best friend. The lover of our souls. Our provider. Our comforter. Our peace. Our healer. HE gives us Mercy and Grace. Are we getting it? Spend time with HIM today. Get to know HIM better today. Let HIM know you better today. JESUS is opening doors for us share the Gospel all the time. Let’s do it today. No one knows about tomorrow. Today is the day. These scriptures are very powerful. If you don’t do what it says in them then you won’t enter into the kingdom of GOD.